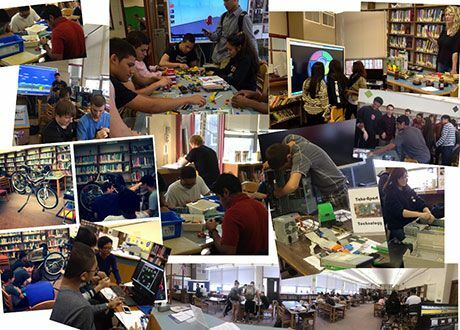 Attract students to libraries and other rooms of learning by creating agile, inviting spaces with makerspace elements and, most importantly, a community feeling. Editor's Note: Elissa Malespina, Jennifer LaGarde, and Laura Flemming contributed to this post. I have always been infatuated with libraries. As a child, my mom used to take me to the local public library for story time. During high school, I spent hours tucked into stacks, looking for a quiet place to learn. However, in college, I quit the library. Not because of computers, or eBooks, or any sort of technology, but because most of my work required collaborating with peers, and the library was not conducive to that interaction. Even Core, with its big round tables and study rooms, was considered a "quiet space." Recently, I wrote about the transformation of libraries from archives of resources to active learning commons that encourage exploration, creation, and collaboration. However, in that post, I profiled a number of locations that made significant financial investments in their redesign. 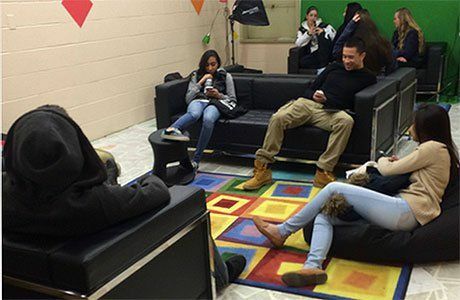 Million-dollar learning spaces are often not a reality for most schools. However, that is no reason to abandon the concept of transformation. 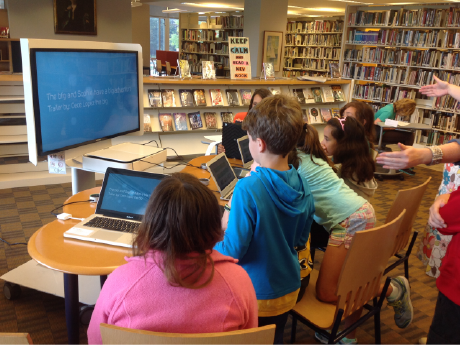 Here are four suggestions from librarians and educators who have transformed their learning spaces -- even without a budget. Classrooms and libraries often have a uniform appearance even though they could be used for a multitude of activities. Elissa Malespina -- history teacher, librarian, and Coordinating Supervisor of Educational Technology for the Parsippany-Troy Hills (New Jersey) School District -- recommends putting caster wheels on tables and bookshelves. This relatively inexpensive adaptation allows you to quickly push tables together for collaborative activities, or move bookshelves out of the way to open up more space, ultimately creating a more flexible learning environment. To encourage collaboration and brainstorming around the room, Jennifer Lagarde -- classroom teacher and librarian from North Carolina -- recommends using whiteboard paint, chalkboard paint, or shower board to transform tables, walls, and floors into writing and drawing spaces where students can brainstorm, share ideas, and co-create. She also suggests using plexiglass, cut to the size of the table, to create another editable space. This way, you can remove and place things (flyers, student work, graphic organizers, sentence strips, etc.) underneath to guide student interactions. In a Teacher-Librarian Virtual Cafe webinar this fall, Jennifer co-presented the concept of MacGyver Librarianship: The Art of Doing More w/Less! From giant spools to donated furniture, she has a number of recommendations for how to create truly unique learning spaces. When Carolyn Foote redesigned the library at Westlake High School in Austin, Texas, she included a "juice bar" as a space that would encourage teachers and students to congregate and engage in co-learning. Similarly, Laura Fleming -- Library Media Specialist in New Milford, New Jersey -- repurposed a room in her library to create a library lounge, where students could gather to read, eat, work, and socialize. To save money, she even tiled the floor in dictionary and atlas pages using Elmer's glue and water! Get donations of jigsaw puzzles, Legos, and board games, and put them out for students to play with during free time. Consider permitting food and drink in lounge spaces, and if possible, include a coffee/tea/hot chocolate station. If it falls in line with the school or district Acceptable Use Policy, encourage the use of personal devices and even provide charging stations. Include varied seating areas such as cafe and gaming tables. When students and teachers want to congregate in learning spaces, opportunities for spontaneous co-learning may present themselves. In Too Big to Know, David Weinberger writes that "the smartest person in the room is the room." By reinvisioning a learning space, more students may come inside. At the heart of constructivism lies the concept that "to understand is to invent" (Jean Piaget, 1976). When students have the opportunity to construct their own understanding, they engage in more meaningful learning. So in transforming your library or any other learning space, think about providing opportunities for all students to invent, tinker, create, and learn. Designing this space doesn't have to break your budget, either. Jennifer suggests visiting your district's surplus furniture warehouse to search for "treasures," using old wire spools from the local telephone or electric company to build tables, and soliciting donations from families -- especially when they are ready to clean out their closets. 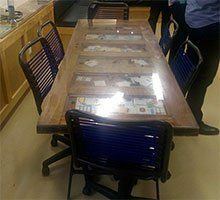 Old video game systems, outdated computers, and other gadgets can be great additions to your makerspace. It calls for the creation of new environments that improve learning. It is about changing school culture and about transforming the way learning and teaching occurs. It is a transformation that calls for physical, virtual, and pedagogical changes as well as a shift in mindset for all players. Laura suggests that the culture of your library should not only encourage meaningful student learning, but also provide the tools, resources, and opportunities for your students to thrive and flourish. While we have been discussing the impact of transformation on libraries, all learning spaces could support your learners and encourage them to contribute to building a dynamic community.